Must always be kept on a leash when outside a fenced area since they are sight hounds and can run faster than you! Should not live as outside dogs! Greyhounds give us non-judgmental love and affection. You cannot get that from humans – including spouses, children, family and friends. They love you but see and point out your flaws. Your greyhounds do not even recognize your flaws, much less point them out. In addition, having a greyhound around the house allows you to be alone without being lonely. Dogs fill a void and love you constantly. A vital component of canine companionship and love is touch. Touch is the first sense you have as a child and it is the last sense that goes. William Wedgman, the photographer, said when he lost his dog, Fay Ray, that the idea of the door became meaningless. There was no one to care whether he went out the door or came in the door. Greyhounds make us laugh – especially when we play with them! They are such comedians, whether they mean to be or not. As adults, we rarely play as we did as children. When you have a greyhound, you need to fit play into the schedule, as the greyhound will remind you. There is an unfettered enthusiasm about dogs. Their play is uninhibited. 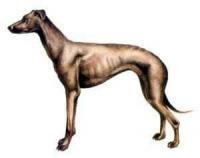 Each greyhound has a play trigger – getting out the leash, getting a pig ear, having his tummy tickled, etc. Having a good laugh results in positive physical changes in humans, too. It lowers blood pressure and is very therapeutic. Greyhound owners tend to get more exercise because their greyhounds need exercise. It gives you motivation. It gives you a reason to be healthier. Not only do greyhounds act as exercise coaches, they also encourage us to experience fresh air and the beauty of the outdoors. Dogs are our link to the natural world. Greyhound owners meet and talk to people they normally wouldn’t if they didn’t have a greyhound with them. How many times have you been stopped by someone asking about your dog when you are out walking your greyhound? You talk to people you would not ordinarily have before. In addition, greyhound owners seem to gravitate to other greyhound owners. Many times you know people by their dogs’ names. Greyhounds are a bonding agent. Greyhound owners also chat with their greyhounds (whether you will admit it or not). A greyhound will also lend a welcome ear no matter the topic. Studies have shown that people actually relax when talking to their dogs. Owning a greyhound is work, especially when it comes to training. While work challenges us, it also strengthens us. It teaches us patience and the reward is amazing. You and your greyhound both have a feeling of accomplishment. It gives you balance. A greyhound is more than just a dog. As your companion it is also a family member – often the member with the most desired attributes.